Let’s chat so we can create custom wedding invitations completely tailored to your vision and designed to perfectly set the tone for your wedding day. 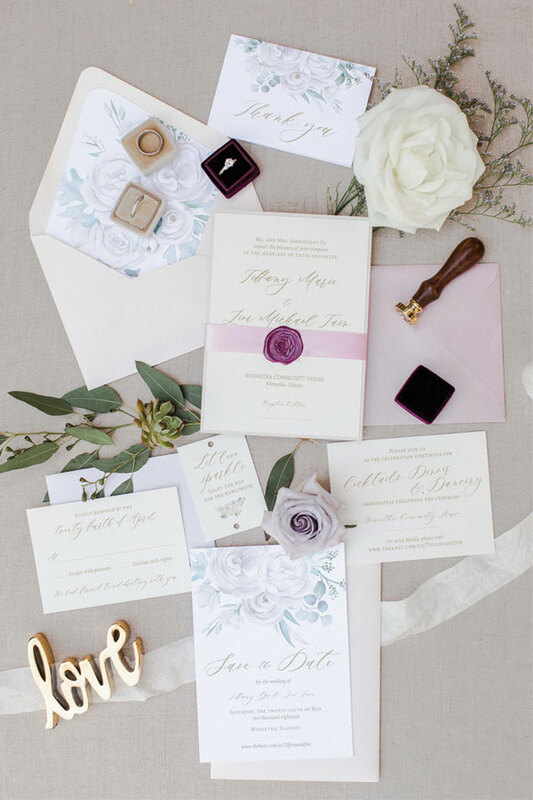 Take the ease out of the invitation wording and let me guide you through the world of paper goods and invitation etiquette while making designing your wedding invitation suite a stress-free process! Compete the Custom Wedding Invitation Inquiry Form. • Schedule a 15 Minute Call over the Phone or if you are a email person, let me know and we can make that work. • We will get to know each other, explain the design process, learn about your vision and how we can bring it to life. • When we meet we will look through stationery designs, sketch ideas, and play with all the goodies that bring together your perfect design. • After deciding on what makes your perfect Wedding Invitation Suite, we will put together a proposal listing the detailed estimate of the work. • Once you are happy with the proposal and ready jump into the fun part of designing your invitations, we will move forward with a signed contract, personalized time line, and initial 50% deposit. • After receiving your contract and deposit, your client portal is activated. This is were everything from invoices and contracts, forms, proofing, and more will be organized. This has been so helpful for my clients keeping everything streamlined. • After receiving your wording questionnaire, I will create a Look Book that includes digital representation of our vision including typefaces, ink colors, design ideas, and your wedding invitation wording options. • Please always provide feedback on this step so we can make sure everything is just right in the designing process. • For clients who were not able to meet in person, I will send you swatches of paper samples so you can choose the best colors and textures for you. • Using the approved Look Book, I will create 2 – 4 different designs for you to review. • You can select one or mix and match parts of the designs. • The concept will them be echoed throughout the other pieces of your suite. • We will edit the designs until it you LOVE it! Custom clients will receive three complimentary edits. • After you are completely happy with all the pieces and approve them for printing, I send your invitations off to the printing press. can be expected to ready for mailing within 1 – 4 weeks from your approval date, depending on needs of assembling suite. • Once I receive your order, I inspect all your wedding paper to make sure they are perfect. • Ribbons, envelope liners, wax seals, and more – this is when I assemble all the pieces so you can enjoy time with your fiancé. • You have two options that you choose during the print approval. • Option One: I package it up and send an email confirming your shipping address and an invoice for shipping and handling. All packages will be insured at your full invoice amount and will require an adult signature. I cannot do this until your package is ready to ship since it’s based on weight and destination. • Option Two: I package up your order and send an email for you to schedule your pickup time. 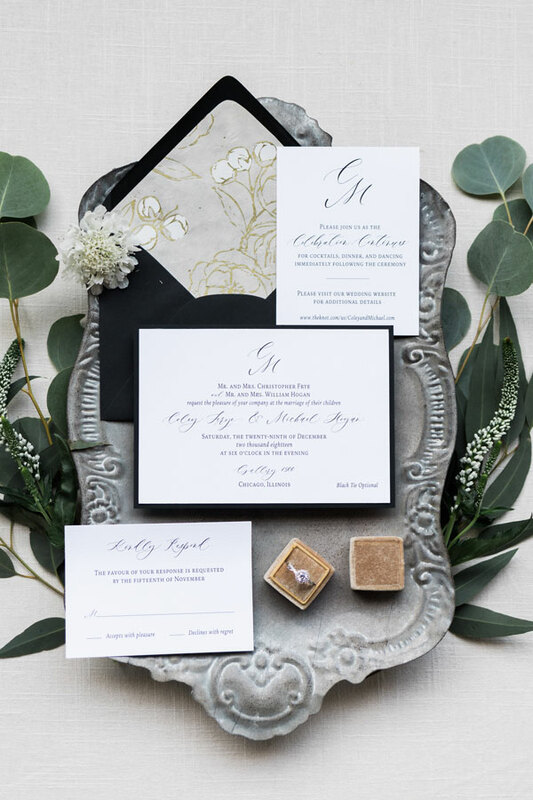 Each Emery Ann Collection Suite can be customized to your vision by choosing your printing method, paper, ink and envelope colors to fir your wedding day vision. You can also upgrade your wedding invitations by adding an envelope liner, wax seals, and envelope addressing. • We will get to know each other, explain the design process, learn about your vision and how we can bring it to life by customizing our Emery Ann Collection designs. • Once you are happy with the proposal and ready to jump into the fun part of designing your invitations, we will move forward with a signed contract and a 50% retainer. • After receiving your contract and deposit, we will help you with all the ins and outs of invitation etiquette and put together the perfect wording for your special day! • If you wish to see some samples of the colors, I will send you some of the products you are considering. • Using your chosen Emery Ann Collection Design, font styles, and colors, we will create your first round of proofs. • We will edit the designs until it you LOVE it! Emery Ann Collection clients will receive two complimentary proofs. • All pieces can be expected to be ready for shipping to you within 5 – 24 days from your approval date, depending on your printing style and assembly needs.